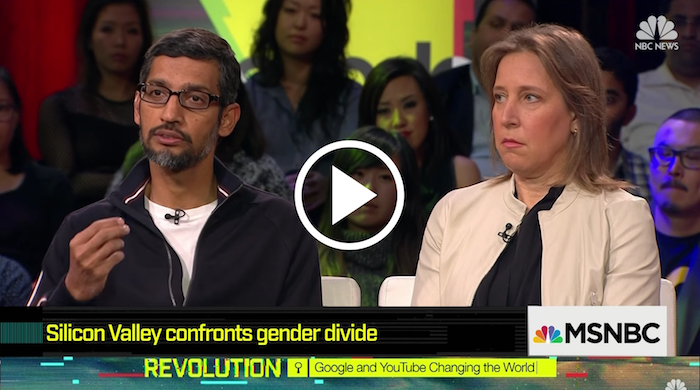 This week, MSNBC and Recode hosted a town hall with Google’s Sundar Pichai and YouTube’s Susan Wojcicki to get their thoughts on how technology is affecting the U.S. and what responsibility big tech has in ensuring that all Americans get to reap the benefits of innovation. The town hall touched on a number of buzzy topics right now, including immigration, the role platforms like Google and Facebook may have played in the 2016 presidential election, and diversity in tech. The portion that piqued my interest was when Recode’s Kara Swisher and MSNBC’s Ari Melber asked Pichai and Wojcicki about how artificial intelligence will change the way America approaches job training. Artificial intelligence has the potential to automate a continuous onslaught of white collar skills — from accounting to radiology — and Swisher wanted to know what Google is doing to help prepare American workers for a future where the job they went to college for may one day be automated. “Twenty, thirty years ago — you educated yourself, and that carried you through for the rest of your life. That’s not going to be true for the generation which is being born now. They have to learn continuously over their lives — we know that, so we have to transform how we do education,” Pichai said. “You need to move forward with that technology responsibly — that means partnerships between government and private companies to be able to make sure that … whichever group whose job ends up changing has that support system to be able to retrain to be able to find what that next set of jobs are,” Wojcicki added. I think that this is a correct assumption, but I don’t think that the public and private sector is tackling the issue of affordable education with the urgency it needs to, if there will indeed be a future where American workers are going to have to train for multiple jobs over the course of their lifetime. Tech companies are addressing this issue, but there are potential pitfalls that could arise with their models. Google teamed up with Coursera a couple of weeks ago to launch a low-cost online program to train entry-level IT professionals — but it remains to be seen if this is a model that can work across multiple professions, and if similar programs can be created without being subsidized by Google. And a new startup I wrote about yesterday called Lambda School wants to make software engineering education more affordable through the use of income-share agreements — but this model may still be too costly for people who have existing debt. I’ve included the link to the full Recode/MSNBC town hall as today’s featured video. The discussion on job training begins at roughly the 33 minute mark.